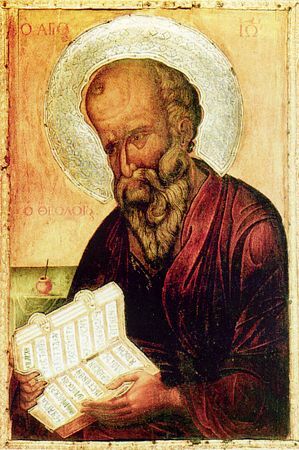 The Apostle and Evangelist St. John, called the Theologian, was the son of Salome and Zebedee. Zebedee was a fisherman of Galilee who possessed rather vast holdings with workers. He was a member of some importance in the Jewish community, having access to the high priest. John's mother Salome is mentioned as being one of the ranks of women who served God with their possessions. John was at first the disciple of St. John the Baptist. Listening to his witness of Christ as the Lamb of God Who takes away the sins of the world, he, together with Andrew the First-Called, followed the Saviour. Being a steadfast disciple of the Lord, he and his brother James were called by the Lord Himself at a later time after a successful catch of fish in the sea of Galilee. Together with Peter and James, John was deigned worthy to become close to the Lord, being with Him during the most important and triumphant times of His earthly life. Thus, he was worthy to be present at the resurrection of the daughter of Jairus, to see Christ's transfiguration on Mount Tabor, to hear the discourse on the signs of His second coming, and to witness to His prayer at Gethsemane. At the Last Supper he was so close to the Lord that in his own words, he lay his head upon Christ's bosom, whence originated his name "bosom-friend," which has since become a name for someone who is especially close. Out of humility, not calling himself by name but nevertheless speaking of himself in the Gospel, he refers to himself as the disciple "whom Jesus loved." The Lord showed this love of him when He was on the cross—He entrusted His Most Holy Mother to him saying: "Behold thy mother." Zealously loving the Lord, John was filled with indignation at those who were hostile to the Lord or who estranged themselves from Him. While traveling through Samaria he prohibited those who did not walk with Christ to cast out demons in the name of Jesus Christ (cf. Mk. 9:38), and asked the Lord's permission to consume with fire certain residents of a Samarian town for not accepting Him (cf. Luke 9:54). For this he and his brother James were called by the Lord "sons of thunder" (Boanerges). Feeling the love of Christ toward himself, but as yet not enlightened with grace by the Holy Spirit, he decides to ask for himself and his brother James a place close to the Lord in His future Kingdom and learns of the impending sufferings for both of them. After the Lord's Resurrection, we often see Apostle John together with Apostle Peter, together with whom he is also considered a pillar of the Church, and with whom he often travels to Jerusalem. True to the Lord's command, he cared for the Holy Virgin Mary as a most devoted son, and only after her Blessed Dormition did he begin to preach in other lands. During Apostle John's ministry, one notices that he uniquely chose for himself a specific province and directed all the energy of his soul to eradicate paganism there and strengthen the holy faith. As an example of his specific care were the seven Churches of Asia Minor—in Ephesus, Smyrna, Pergamos, Theatira, Sardis, Philadelphia and Laodicia. He lived mainly in Ephesus. During the time of Emperor Domitian (81-96), Apostle John, as the sole surviving Apostle, was summoned to Rome and by the decree of this persecutor of the Church was thrown into boiling oil, but the power of God saved him unscathed just as it saved the three youths from the fiery furnace. Then Domitian sent him to the desert island of Patmos. Here John wrote the Apocalypse, or Revelations of the fate of the Church and the world. After the death of Domitian, Apostle John returned to Ephesus from exile. The Bishops and presbyters of the Ephesian Church showed him three Gospels written by the Apostles Matthew, Mark and Luke. Having approved these Gospels, Apostle John deemed it necessary to supplement that which was lacking and which he knew well, being the last of the living eyewitnesses. This was of great importance, since toward the end of the first century there appeared in the Christian world several active gnostic sects which abased and even denied the Divinity of the Lord Saviour. It was imperative to protect the faithful from that teaching. In his Gospel, Apostle John explains the Saviour's sermons given in Judea. These sermons directed at the learned scribes were more difficult to understand, and most likely due to this fact were not contained in the first three Gospels, which were designated for the newly converted pagans. Before beginning to compose the Gospel, Apostle John designated a fasting period for the Church of Ephesus and withdrew with his disciple Prochorus to the mountain where he wrote the Gospels bearing his name. From ancient times the Gospel according to John were called spirit-filled. In comparison with the other three Gospels, they contain more the sermons of the Lord regarding the deepest truths of faith—on the incarnation of the Son of God, on the Creator, on the redemption of mankind, on spiritual rebirth, on the grace of the Holy Spirit and on Communion. From the first words of the Gospel, John elevates the thoughts of the faithful to the hieghts of the divine emanation of the Son of God from the Father: In the beginning was the Word, and the Word was with God, and the Word was God (Jn 1:1). Apostle John expresses the aim of his Gospel thus: But these are written, that ye might believe that Jesus is the Christ, the Son of God; and that believing ye might have life through his name (Jn. 20:31). Besides the Gospel and the Apocalypse, Apostle John wrote three epistles which were incorporated into the the New Testament books as Ecumenical (universal) Epistles. The main thought in his epistles was: Christians must learn to love: Beloved, let us love one another: for love is of God; and every one that loveth is born of God, and knoweth God. He that loveth not knoweth not God; for God is love (1 Jn. 4:7-8). Herein is our love made perfect, that we may have boldness in the day of judgment: because as he is, so are we in this world. There is no fear in love; but perfect love casteth out fear: because fear hath torment. He that feareth is not made perfect in love. We love him, because he first loved us. If a man say, I love God, and hateth his brother, he is a liar: for he that loveth not his brother whom he hath seen, how can he love God whom he hath not seen? And this commandment have we from him, That he who loveth God love his brother also (1 Jn. 4:17-21). Regarding the subsequent ministry of Apostle John, tradition has preserved some wonderful information showing to what extent his heart was filled with love. While visiting one of the Asia Minor Churches, John noticed among his listeners a youth who distinguished himself with unusual gifts, and he entrusted the youth to the care of a bishop as a special ward. Later on this youth got involved with unsavory friends, became debauched and the leader of a gang of bandits. Hearing of this from the bishop, John went into the mountains where the bandits were ravaging, and he was seized and brought before the chief. On seeing the Apostle, the youth became embarrased and began to run away. John pursued him and with touching words of love encouraged him. He finally brought him to Church, shared with him the labors of repentance, and did not rest until he had totally reconciled him with the Church. During the last years of his life the Apostle preached only one precept: Children, love one another. His disciples asked : "Why do you repeat yourself?" Apostle John answered: "This is the most important commandment. If you will fulfil it, then you wil fulfil all of Christ's commandments." This love would turn into a fiery fervour when the Apostle met false-prophets who corrupted the faithful and deprived them of eternal salvation. In one public building he met the false prophet Cerinthus who denied the Divinity of the Lord Jesus Christ. "Let us depart quickly" said the Apostle to his disciple "I fear this building might collapse around us." St. John the Theologian died a natural death (the only one of the Apostles to do so), being around 105 years of age, during the time of Emperor Trajan. The circumstances of the Apostle's death appeared unusual and even puzzling. At his own insistence, the Apostle John was buried alive. On the following day, when the tomb was unearthed, it turned out to be empty. This event affirmed the belief in the conjecture of some Christians that Apostle John will not die but will live until the Second coming of Christ and that he will unmask the Antichrist. The words said by the Saviour not long before his Ascension gave them cause to surmise this. When the Apostle Peter asked after turning to the Apostle John, And what shall this man do? the Lord answered, If I will that he tarry till I come (the second time), what is that to thee? Follow thou me. Apostle John makes a notation regarding this in his Gospel: Then went this saying abroad among the brethren, that that disciple should not die (Jn. 21:22-23).